Featured Image: Researchers think that the Cow may be a very rare, unusual type of supernova – the death of a massive star. The image shows the remnant of RCW 86, the oldest documented supernova, observed in 185 A.D.
Scientists call it the AT2018cow – but of course it doesn’t go moo. The name is simply chosen based on a randomised three-letter naming convention. But as supernovae go, it’s certainly a whopper, and an extremely unusual, never before seen type of supernova (if it is indeed one – which isn’t confirmed yet). “It was fast, blue and bright,” says Regis Cartier, a researcher who observed Cow with the Southern Astrophysical Research SOAR Telescope in Chile. “I dropped everything else I was doing.” The stellar explosion was not only extremely bright, it also lit up science instruments across the electromagnetic spectrum. First spotted on June 16 last year, the results of the observations have just been announced at the 233rd meeting of the American Astronomical Society in Seattle. The Cow was first noticed – and named – by Stephen Smartt, an astronomer at Queen’s University Belfast, while he was analysing data from two asteroid-tracking ATLAS telescopes in Hawaii. His team sent out an alert to the astronomical community the next day. Shortly afterwards, multiple observatories all around the globe zoomed in on the unusual event – in the best spirit of a very new field known as multi-messenger astronomy. Since about three years now, scientists drop any non-urgent observations and co-ordinate their research whenever something spectacular happens in the universe. Apart from the two ATLAS telescopes, the veteran Keck twins, also in Hawaii, swiveled into action, together with a telescope on La Palma, one of Spain’s Canary Islands, and several other instruments – focusing on the event for days, weeks and months. Researchers are still trying to make sense of what exactly the Cow is (or was), though. The main theory is that we have witnessed a collapse of a star in action – forming a black hole or a neutron star, a sort of super-dense stellar corpse, 200 million years ago. And it happened in the (relatively) nearby constellation Hercules, on the outskirts of a dwarf galaxy there. 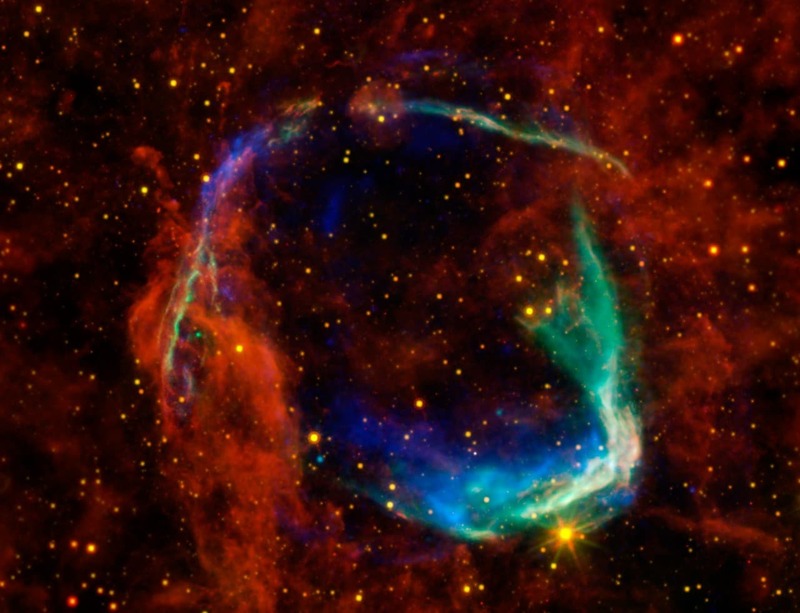 When a massive star dies, its core implodes, causing a bright explosion – a supernova. The core collapses into either a black hole or a neutron star. That’s a theory, though, and the Cow could be the most direct evidence yet of how such an event unfolds. Supernovae have been observed since 185 AD, when Chinese astronomers recorded their observations of a “guest star”. The term supernova was coined by Swiss astronomer Fritz Zwicky in 1934. Until now, scientists had classified seven different types of Supernovae (Type 1a, 1b, 1c, II, III, IV and V), but the Cow is different. First, the event was unnaturally bright – 10 to 100 times brighter than the typical blast of an exploding star. It also reached its peak brightness over just a few days, while typical supernovae can take weeks, and the Cow’s visible light disappeared in just 16 days; the supernova observed in 185 AD, for example, lasted at least eight months. At first, Smartt and colleagues gathered mostly optical data – which prompted a team led by Daniel Perley, an astrophysicist at Liverpool John Moores University, to suggest that the event was the moment a black hole ripped apart a star. This is known as tidal disruption. But soon data in other wavelengths started trickling in. Astronomer Anna Ho at the California Institute of Technology and the lead author of a paper accepted to the Astrophysical Journal, started observing the Cow in radio. First, she used (remotely) the Submillimeter Array in Hawaii, and then – the Atacama Large Millimeter/Submillimeter Array (ALMA) in Chile. The short-wavelength radiation from the Cow that ALMA picked up continued for weeks, again unlike a typical supernova, enabling the team to observe the phenomenon for 80 days. This indicates, Ho says, the presence of some kind of a central engine – a just-born black hole accreting matter, or a rapidly rotating, highly magnetised neutron star. “There wasn’t just a single release of energy in an explosion, so there must be some kind of ongoing energy production,” Ho adds. Another team, led by Raffaella Margutti, an astrophysicist at Northwestern University, arrived to the same conclusion. The researchers spied on the Cow looking for X-rays with NuSTAR and the European Space Agency’s INTEGRAL space telescopes, and for radio waves using the National Radio Astronomy Observatory’s Very Large Array.